The Mavs have looked fantastic in the playoffs. They're strong and quick and deeper than any other team in the league. But they were a little lucky to get past the Spurs. Dallas would have been eliminated by the Spurs had it not been for a terrible Manu Ginobili foul at the end of Game 7. And the Mavs were fortunate to get the Suns in the conference finals, considering the Suns were injured and exhausted and had no bench. I think Dallas is in for a much tougher matchup with Miami. Shaq dominates the middle. The guy is still more powerful than a locomotive and, having dropped 20-or-so pounds, even looks light on his feet. He's figured out how to avoid offensive fouls on his post moves. He's making the smart, patient play on the block -- posting, passing, reposting, scoring. He's getting deep position and making a much more upward offensive move to the basket instead of the inward offensive move that was getting him in trouble earlier in the playoffs. On defense, he shuts down the driveway. There will be no easy stuff at the rim for the Mavs. D-Wade is the best player left standing in the playoffs, and it's always good to have the best player on your team. His scoring average (26.2) and his shooting percentage (50.9) have been outstanding, especially when you consider the number of difficult shots he's been forced into taking. The Pistons had some success when they ran several guys at him, but he is skillful and athletic enough to find a crack and exploit it. Wade seems to get stronger as the game progresses and now owns the fourth quarter. His one-on-five drive and acrobatic flip shot against the Pistons was one of the greatest plays of the entire season. Shaq, D-Wade and Riley will get hours of airtime leading up to Thursday's tip, but the most important guy for the Heat in the Finals just might be Udonis Haslem. If Haslem can shut down Dirk, or at least keep him under control, the Heat will win. Haslem has the size, speed and toughness to keep Nowitzki boxed up. He's a little bigger and stronger than the guys Dirk has seen so far in the playoffs. He'll get physical with Dirk and knock him off balance. Haslem harassed Rasheed Wallace into nonfactor status in the Pistons series and will be challenged to do so again in the Finals. So it's up to you, U. If you can defend Dirk, the Heat will win in six. I've had a front-row seat for Miami Heat games for many years, including nine seasons as a Heat broadcaster during coach Pat Riley's initial tenure. Their march through the Eastern Conference, including their decisive six-game demolition of the Detroit Pistons, was as impressive a display as I've ever seen from the Heat. They are playing at a very high level, with the excellent teamwork and defensive effort that fans and Riley always envisioned. I've watched Shaquille O'Neal closely for many years, and especially the last two seasons in Miami. His performance against the Pistons was vintage Shaq, especially in Game 6 -- in fact, that was as good as he's ever been, in my opinion. The problem for Miami and Shaq is this -- the Dallas Mavericks are just not a good matchup for them. The Mavs' trademarks are depth and quickness, two traits the Heat lack. The Mavs' starting lineup is quicker than Miami's, and they can bring in a number of talented, athletic players off the bench. For Dallas, it starts with Dirk Nowitzki, who will be a very tough cover for the Heat. Udonis Haslem will probably need help covering Nowitzki, which will open up the court for the rest of Mavericks. As Chicago showed, a quick, penetrating team can get to the rim and create foul trouble for Shaq. Well, the Mavs are even more talented than the Bulls. Other than Dirk, the Mav who will cause the most headaches is Josh Howard. The Dallas swingman is a defensive stopper who can slow down Dwyane Wade on one end and then run amok on the offensive end, because the Heat just don't have an answer for him. Likewise, the Heat have no natural matchup for Dallas' secondary offensive stars, Jason Terry and Jerry Stackhouse. And that's before you get to Devin Harris and Keith Van Horn, who also will be a handful against the larger, slower Heat. With this kind of team speed, the Mavs at times will threaten to run the Heat right off the floor. Of course, a big question for the Mavs is how they'll match up with Shaq. But even this can turn into an advantage for them if they can make Shaq work at the defensive end. Dallas coach Avery Johnson has the option of going small and forcing Shaq out of the defensive paint. Or he can play Shaq one-on-one with DeSagana Diop and Erick Dampier, two defensive and rebounding specialists who combined for 5-of-7 shooting and 16 rebounds in just 37 minutes the last time these two teams played. The Miami Heat have Shaq, Wade, a savvy team of veterans and a coach with four rings. But they don't have the depth, quickness or shooting ability to match up well with Dallas. That's why I expect the Mavs to win in six. Dr. Jack Ramsay is a member of the Basketball Hall of Fame and the dad of ESPN.com's coordinating editor for the NBA, Chris Ramsay. On February 9, the Mavs mashed the Heat 112-76, jumping out to a 11-2 lead and winning every quarter decisively. 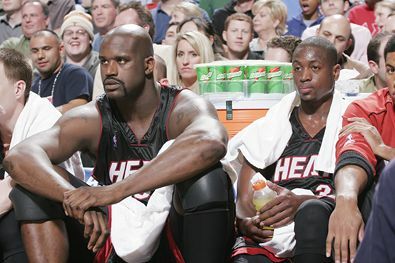 Shaquille O'Neal and Dwyane Wade sat on the bench for the entire fourth quarter. This was their plan even before Dirk Nowitzki led the Mavericks to their first NBA Finals berth, but Dallas is understandably even more eager now to sign Nowitzki to a contract extension this summer. Nowitzki has two years and $31.5 million left on his current deal but can opt out and become a free agent after next season. Club sources indicate that inking the 27-year-old to a new deal, thereby ensuring he never gets to the opt-out point, is a top offseason priority for Mavs owner Mark Cuban. League rules would allow for Nowitzki to receive a three-year extension, which would keep him in Dallas through the 2010-11 season. You have to like Cuban's chances, too, given that the Mavs have made up for the free-agent departure of Steve Nash -- which initially stung Nowitzki deeper than any other setback in his career -- by surrounding him with a young and deep core that has averaged 59 wins over the past two seasons and now sits just four wins shy of a championship. • See Marc Stein's complete blog entry for more on Shawn Marion's future in Phoenix, the relationship between new Kings coach Eric Musselman and free agent Bonzi Wells and the possibility of Sam Cassell moving to the Lakers. Chris (Ft. Lauderdale): Why does it seem that the media is focusing on why Detroit lost instead of why Miami won? And why isn't anyone talking about how much the new additions are proving to be the right moves, because there is now way Damon Jones scores 21 against Chauncey Billups. 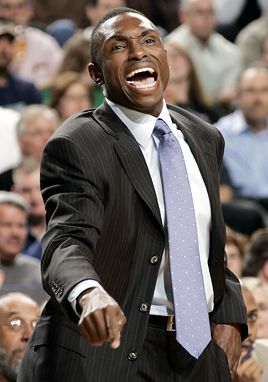 Arber (Detroit): Avery Johnson is a genius. He has turned a second-round-and-out team into a championship team. The Mavs have hit an equilibrium on both ends of the court and their game just flows. Wiley (Herndon,VA. ): After what I saw the Mavs get away with in Games 5 and 6, I never want to hear Mark Cuban complain about officiating ever again! Shame on the NBA for allowing that to happen. It turned an entertaining series to watch into complete garbage! Sam (Chicago): I have one question for Mr. Marc Stein. How do you like your crow? You were one of the most outspoken critics of Pat Riley's changes. Feel a little humble? D-Wade reflects on what he's accomplished so far ... and Miami's worst loss of the season. The Miami Heat are the third franchise Pat Riley has taken to the NBA Finals as a head coach. He also took the Los Angeles Lakers seven times, and the New York Knicks once. Only one other coach has taken three different franchises to the NBA Finals: Alex Hannum, who went with the Hawks, Warriors and 76ers. Phil Jackson and Alex Hannum are the only two NBA coaches to win NBA titles with two different teams. Shaquille O'Neal isn't the only matchup problem Miami presents, and arguably isn't even the major one. Dwyane Wade has followed a brilliant season with an equally brilliant playoffs, and his presence will likely end Devin Harris' tenure as a starter. If the Mavs take the floor with two small guards, one of them would have to guard Wade, and neither Harris nor Jason Terry can handle him. Instead, look for Adrian Griffin to return to the starting lineup and get the first crack at Wade, with relief help from Josh Howard, Marquis Daniels and Jerry Stackhouse. Depending on how Griffin fares, Marquis Daniels could play a much greater role in this series than he has played in the earlier rounds. Meanwhile, the Harris-Terry combo would see the light of day mainly when Wade were to leave the floor. 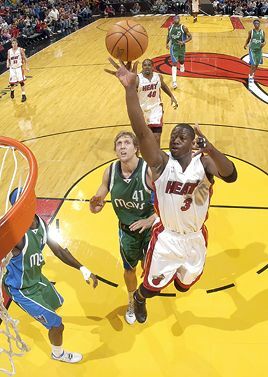 When the Mavs visited Miami on the night after Thanksgiving 2005, Dwyane Wade scored 23, but with Shaquille O'Neal sidelined with a sprained ankle, the Heat fell short, 103-90, as Josh Howard poured in 25 points.